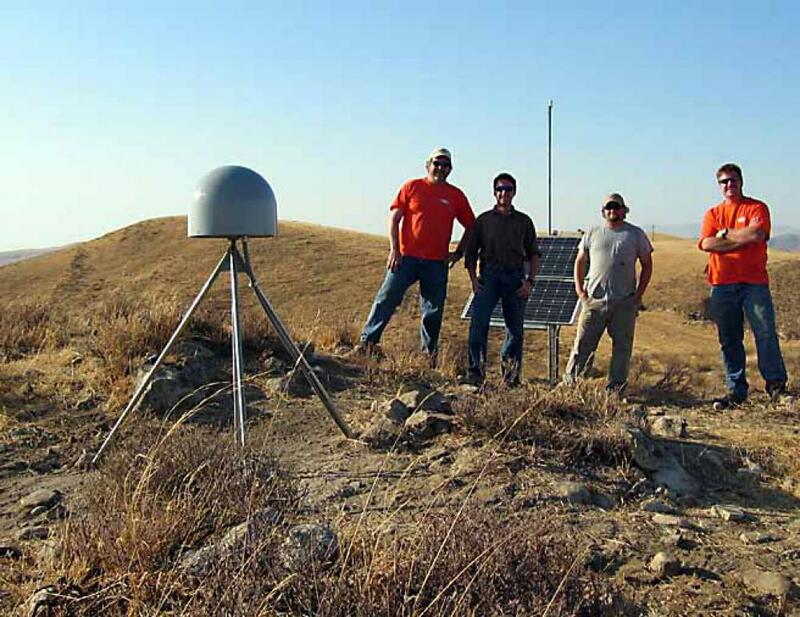 In response to the recent magnitude 6.0 earthquake, PBO crews from the California offices have spent the last two weeks working hard to install a total of five emergency response GPS stations in Parkfield, CA. 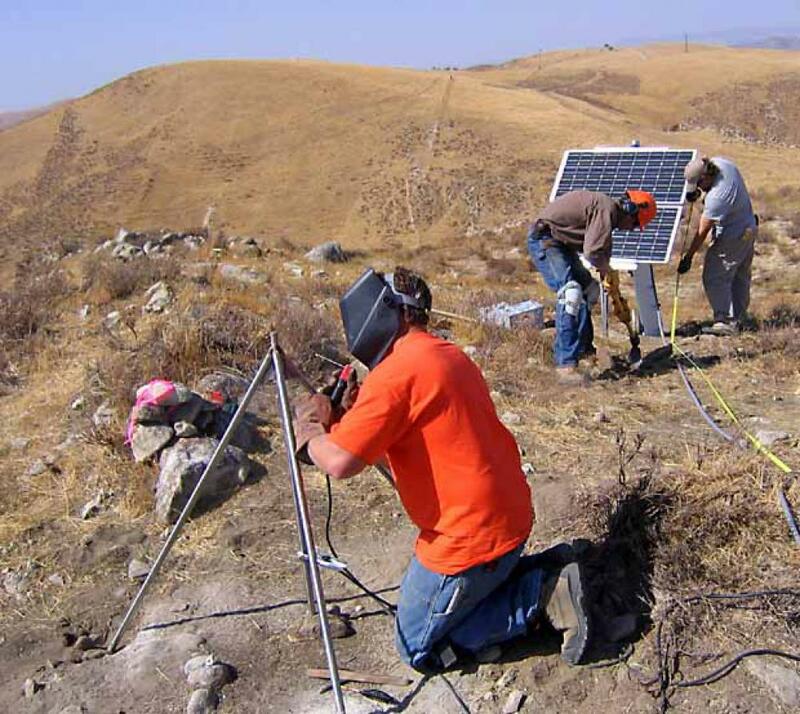 Directed by PBO’s Northern California Regional Engineer Brian Coyle, the stations are being installed to expand the network of instrumentation surrounding the portion of the San Andreas Fault that ruptured during the Parkfield Earthquake. Speed is of the essence in order to obtain data from the time period immediately following the slip event. 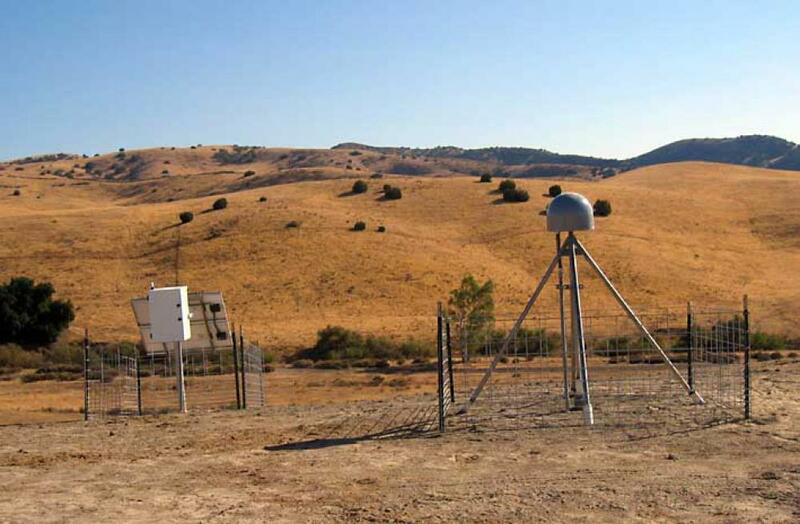 Collected using the highest precision GPS instruments, these data are essential to extending the science community’s understanding of what’s happening to our earth and predicting future fault activity. Thanks to some very long days and late nights by dedicated UNAVCO employees, PBO has successfully put together the teams and equipment necessary to execute this important emergency response. 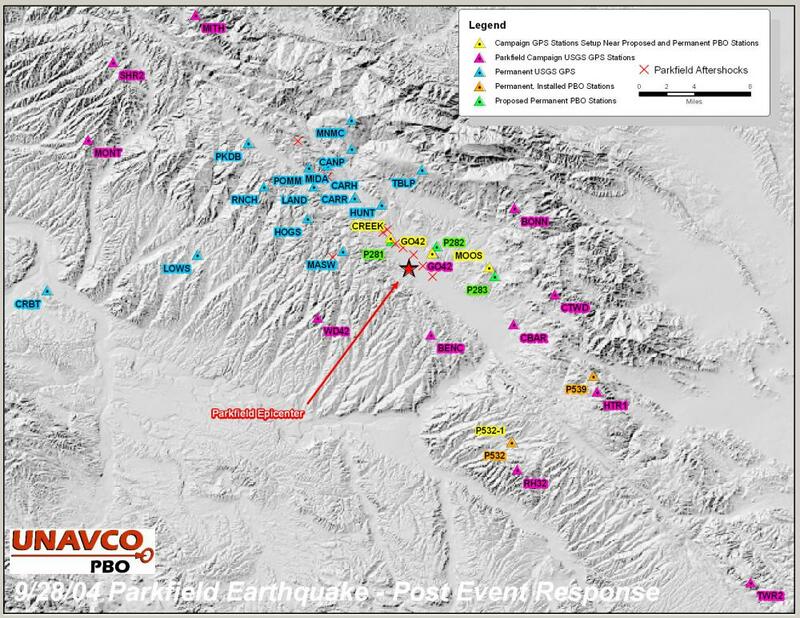 Recognizing the significance of such occurrences, updates on the progress of the PBO Parkfield earthquake response will be posted on this site. 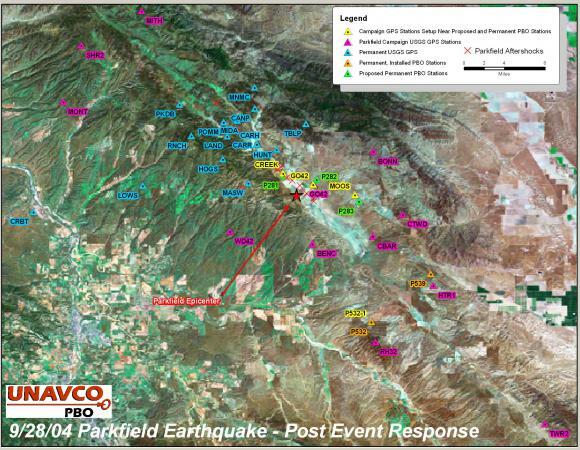 As the unexpected news spread quickly that an earthquake had struck at 10:15 a.m. PDT, just seven miles southeast of Parkfield, an air of excitement began to grow throughout the UNAVCO offices. Already a location on PBO’s list of priority areas to install GPS stations, Dr. Mike Jackson, Director of PBO, called on field crews to carry out an emergency response, bringing Parkfield to the top of the list. Having just been at Parkfield to attend the recent EarthScope Media Day at the SAFOD site in September, and with the recent activity at Mt. St. Helens, Jackson handed the earthquake response efforts over to the PBO regional offices in California. PBO earthquake response teams mobilized to Parkfield from the two California UNAVCO offices. After laying out the initial response plans and gathering enough gear for two installations, northern California PBO Engineers Brian Coyle and Todd Williams left their Richmond, CA office and drove south 4’ hours to Parkfield. At the same time, southern California’s Chris Walls and Ed Arnitz left their office in Riverside, CA and headed north for Parkfield (also about 4’ hours away) loaded with GPS equipment. The two teams met in Parkfield early in the afternoon and were amazed to see all the TV news crews and other press swarming around town. With a population of only 37 people, stories of breaking dishes and fallen pictures were quickly exhausted and the reporters were lining up to interview the scientists who were arriving in a steady stream. After giving a few interviews the PBO crew was able to break away and discuss how to spend the remaining few hours of daylight. They decided to split up into two teams and look for suitable locations for the two southernmost priority installations, P539 and P532. 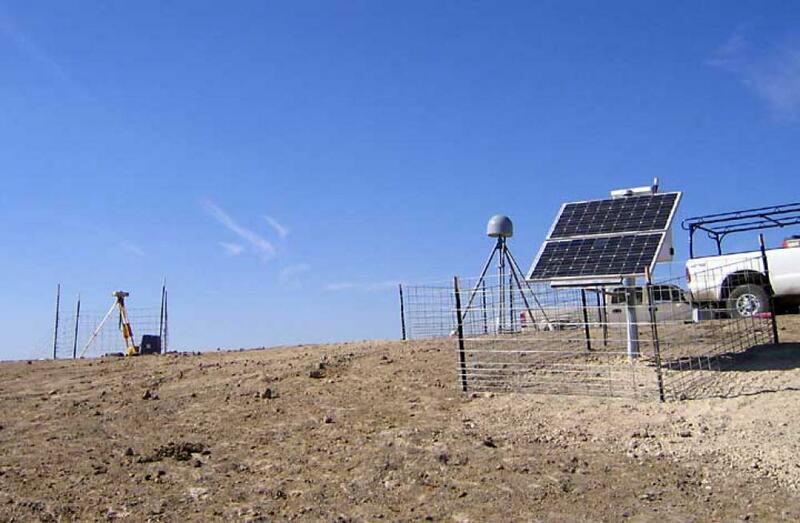 Before a station can be installed, a suitable land location must be found and permission obtained from the landowner. 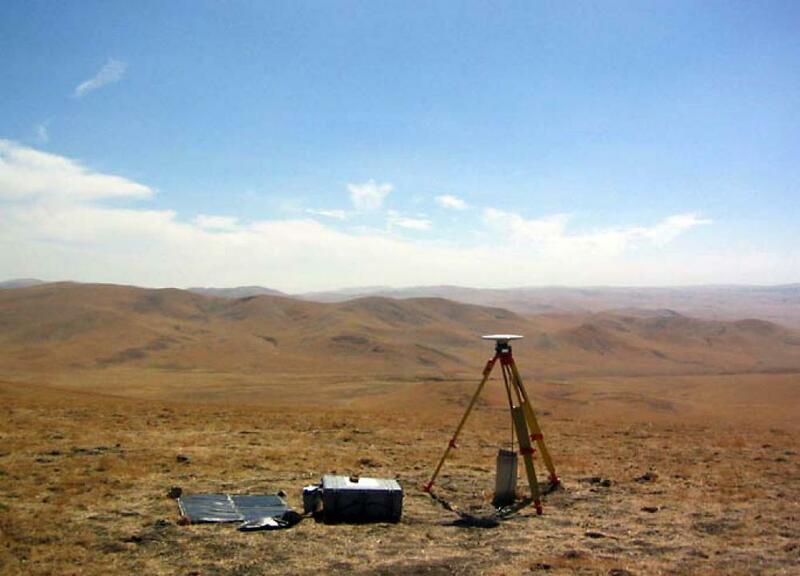 The first step is to do a reconnaissance around the area of the planned sites where stations will be installed. 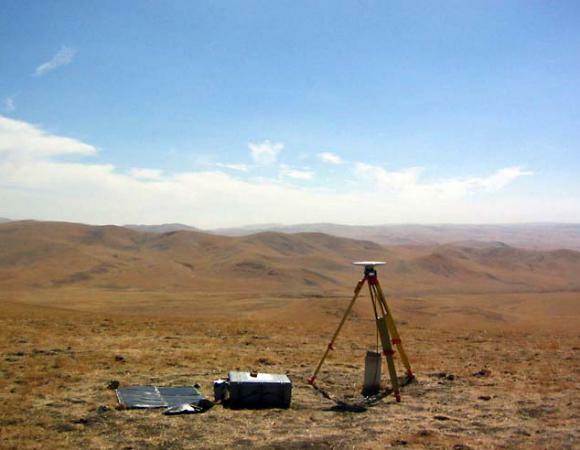 Reconnaissance involves finding a location with a clear sky view to enable good reception of the GPS satellites and data communications, easy access to get equipment to and from the site, and stable ground or competent rock to securely hold a GPS station. 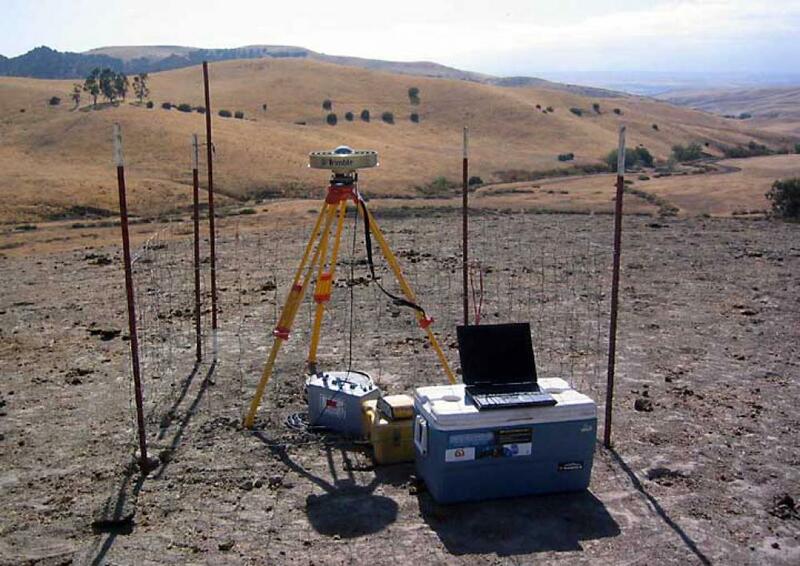 Brian Coyle and Chris Walls started their reconnaissance on site P539, located about 10 miles south of the earthquake’s epicenter, on the east side of the San Andreas Fault. After identifying a potential location on a topographic map, they drove to ‘Vogel Ranch’ where they found a posted phone number for the private landowner. 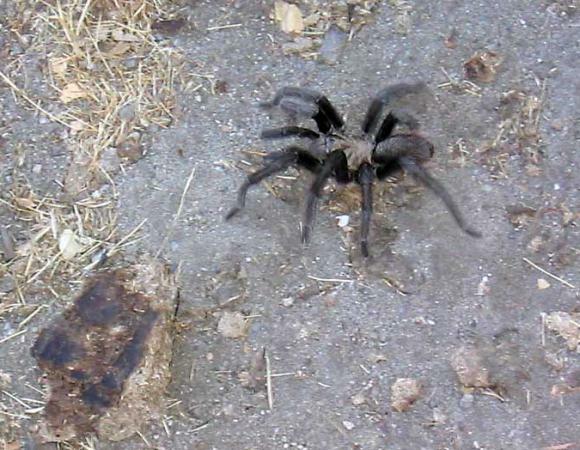 Although the owner was in Los Angeles at the time, Walls was granted access by the landowner to enter the property and look for a suitable location. 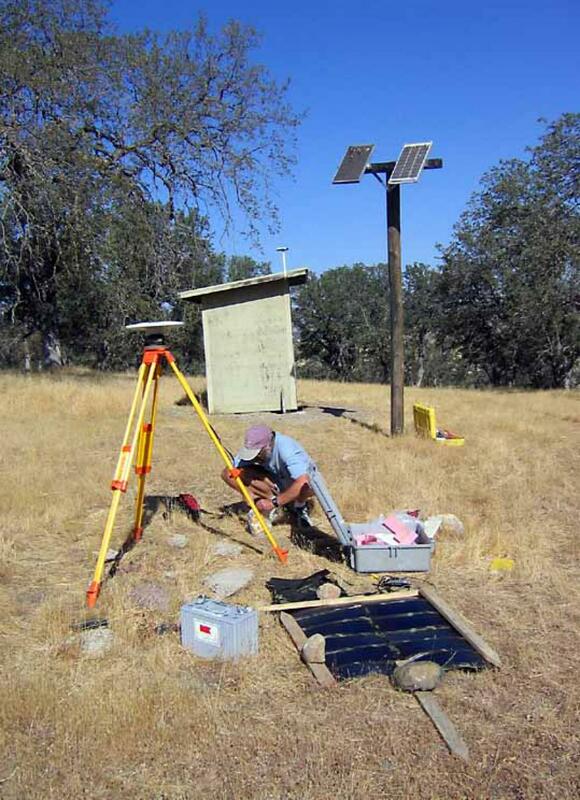 Soon after, a competent site was found just up the hill from a USGS dilatometer (an old version of a strainmeter). 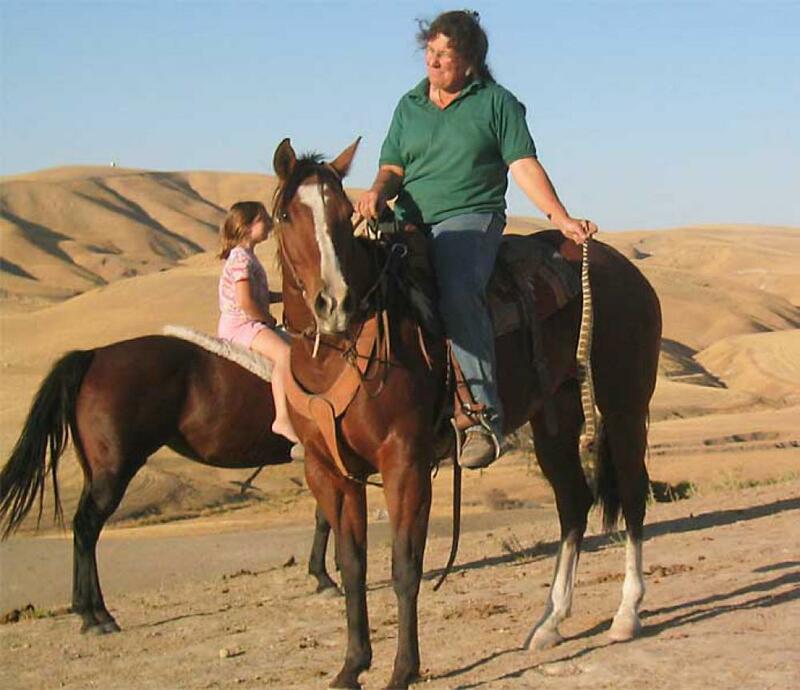 Still needing to obtain a permit to install the station, Walls promised to send the landowner an email containing the project information and permit application in exchange for an arrangement to meet the ranch manager the following morning. 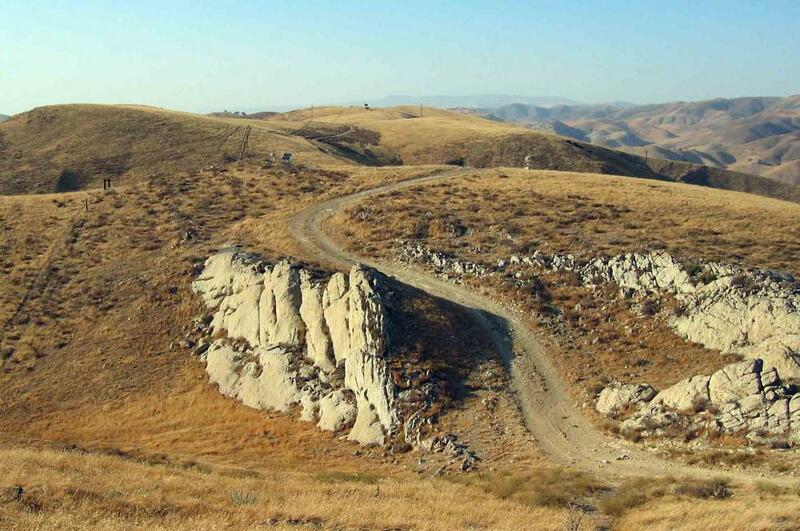 Meanwhile, Ed Arnitz and Todd Williams continued reconnaissance, looking for a suitable location for emergency response site P532, located on the west side of the San Andreas Fault. 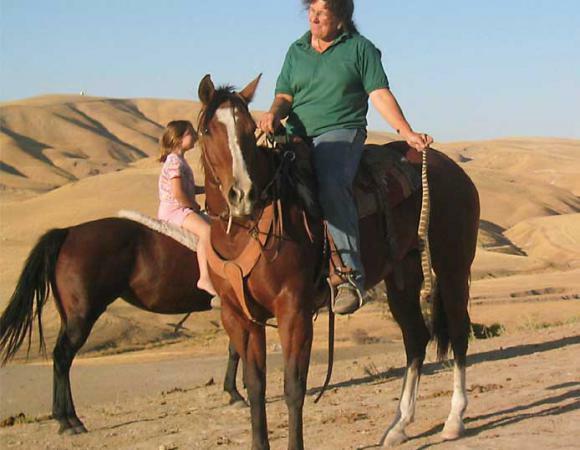 After driving several miles up a section marked ‘Not a Through Road,’ they came upon a small horse ranch with an orchard. 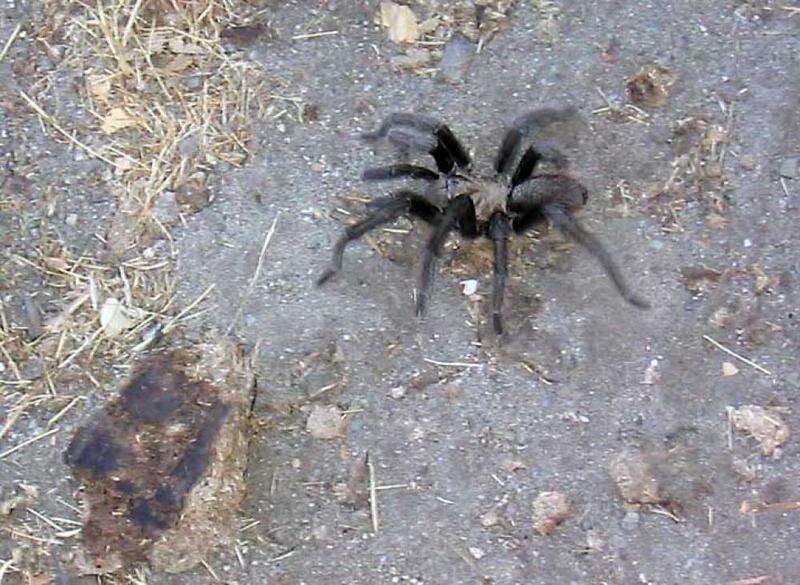 Despite the repeated ‘booms’ of a small cannon (set up in the orchard to scare away the birds), Arnitz and Williams made their way up to the ranch house and knocked on the door. Mr. Wicks, the landowner, initially had reservations about the project, however, after hearing more, agreed to consider a permit. Soon after, an appointment was made to meet again the following day, after Mr. Wicks had a chance to review the permit materials and discuss with the idea with his family. Ed Arnitz and Todd Williams returned to Wicks Ranch in the morning and a signed permit for P532 was easily obtained from Mr. Wicks. Mr. Wicks, a retired water well driller who had worked in the area for over 50 years, welcomed the PBO group onto his land, even giving the crews pomegranates and homemade canned preserves. What a host ’ thanks Mr. Wicks! With easy site access and good ground conditions, the crew decided to install a Deep Drilled Braced Monument (DDBM) at P532. 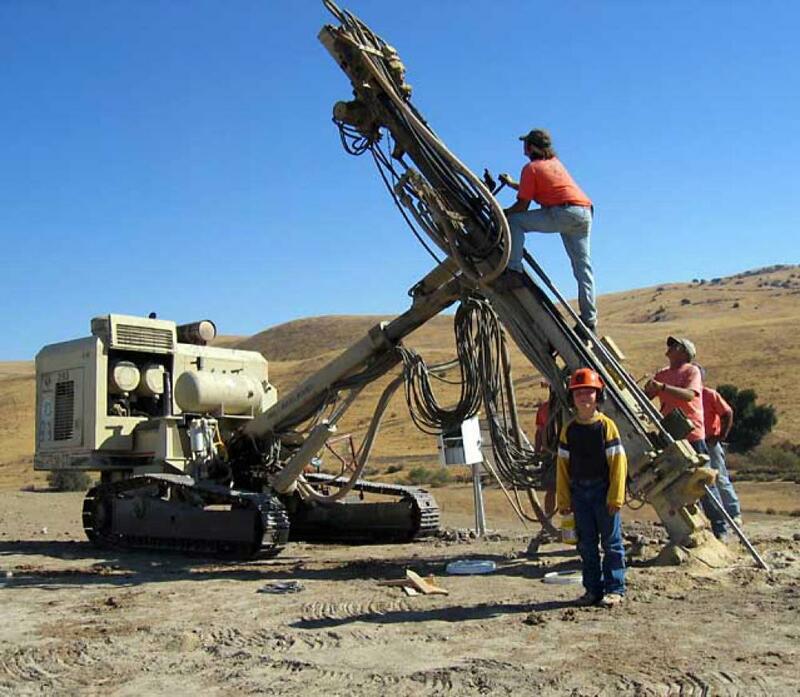 Because the station legs reach a depth of 35 feet below the ground, an available drill rig company would need to be found and hired to do the drilling. Fortunately, a company out of southern California had a drill rig available and was able start drilling early the following week. 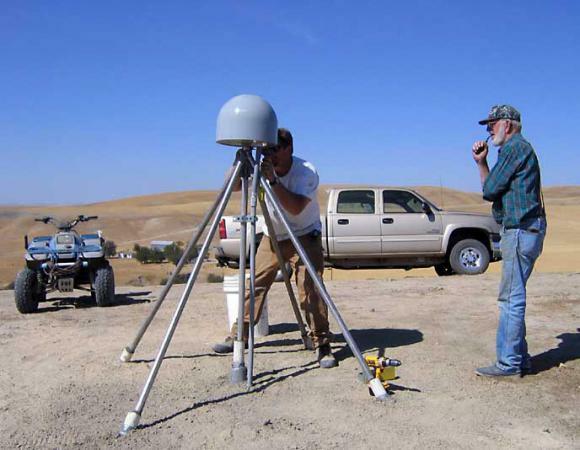 In the meantime, because the data immediately following an earthquake is extremely important, Arnitz and Williams set up campaign GPS equipment near the proposed site location. The campaign GPS is a temporary station that gathers data which will be later tied into the data set of the permanent station after it is up and running. Back at Vogel Ranch, after touring the proposed location with the ranch manager and having another discussion with the landowner explaining the importance of the project, Chris Walls received permission to install emergency response station P539. 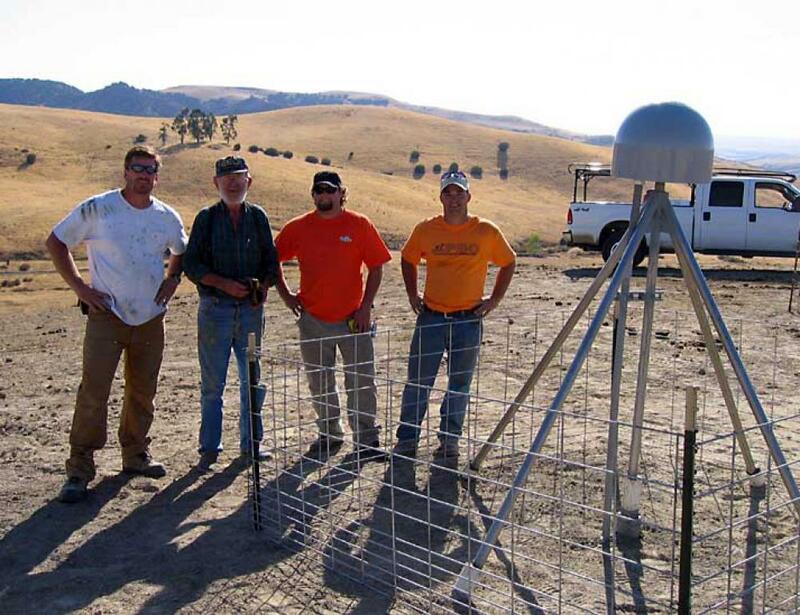 Later that afternoon, Walls joined Coyle in Parkfield and with the permit for P539 in hand, they headed over to Vogel Ranch to begin installing the station. 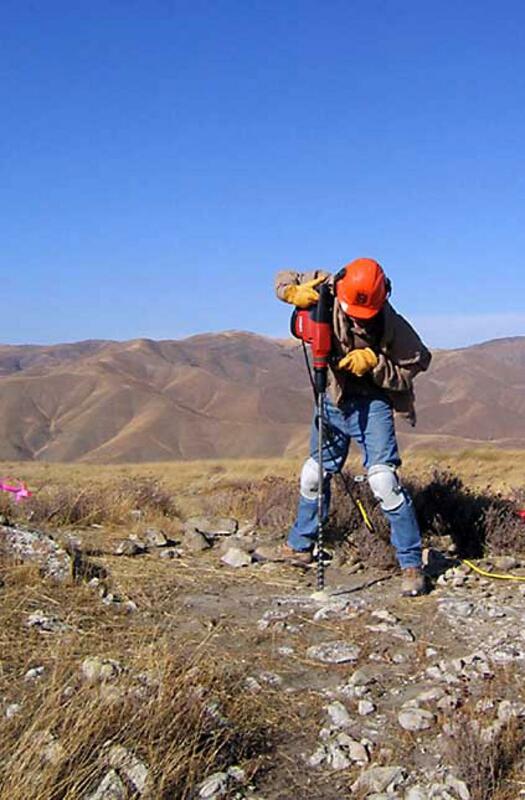 Because this site is not easily accessible due to the steep and narrow access roads, the station will be installed as a Short Drilled Braced Monument (SDBM), instead of a DDBM. 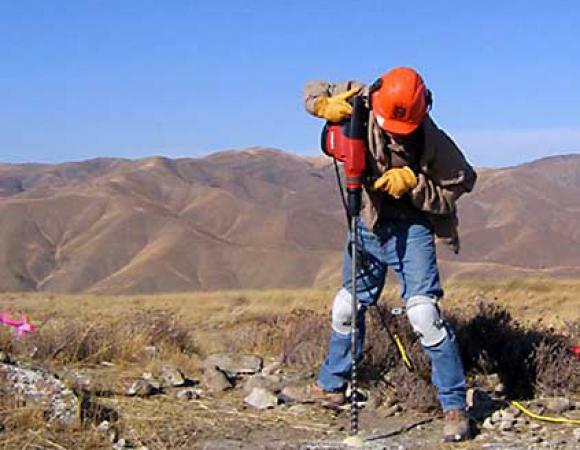 In a SDBM, the legs of the GPS monument only go down 6 feet into the ground, thus holes for the legs can be drilled by hand. Although a DDBM is always the preferred choice, a SDBM can be just as stable if the legs are placed directly into rock at the surface. With good sandstone outcropping at this site, Walls and Coyle proceeded with the installation using a handheld rock-drill and power tools. Later joined by Arnitz and Williams, the crew worked until dark finishing the drilling for two of the four legs and the enclosure post. Amazingly, by starting work at the crack of dawn Friday morning, the PBO crew finished station P539 by 4:30 p.m. Friday afternoon. Not only was the station completed, but the crew had the data from the station transmitting flawlessly back to Boulder through a CDMA modem connection. Working throughout the day with PBO’s Site Permit Coordinator Kyle Bohnenstiehl out of Boulder, Brian Coyle fine-tuned the permit application material and maps for the remaining emergency response sites. As they packed up their P539 equipment and got ready to drive back home, Brian Coyle sent off the final draft of the permit request applications to the landowner for sites P281, P282, and P283. 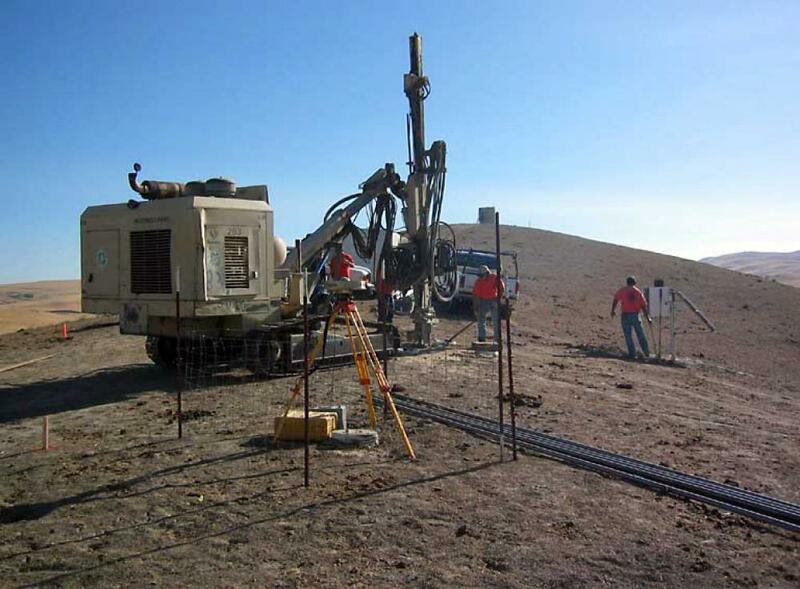 In three days, PBO’s California engineers had acquired two permits, installed one SDBM, and sited and submitted permit applications for the remaining three emergency response sites. Not bad ’ way to go guys! Crews head back to their offices over the weekend to pick up more installation materials and catch up on some much needed sleep. On Monday, the same crews from the northern and southern PBO offices return to Parkfied. In addition, Andre Basset from the northern California office joins the rest of the crew ready to work. The drill rig, contracted out of southern California, arrives at emergency response site P532. PBO crews and the drill rig operators map out the drilling plan and decide upon the exact areas where the holes will be drilled. By the end of the day the drill rig is set up and crews were ready to begin drilling first thing Tuesday morning. While Brian Coyle and Chris Walls work on reconnaissance, Ed Arnitz meets the drilling crew bright and early to start drilling holes at P532. 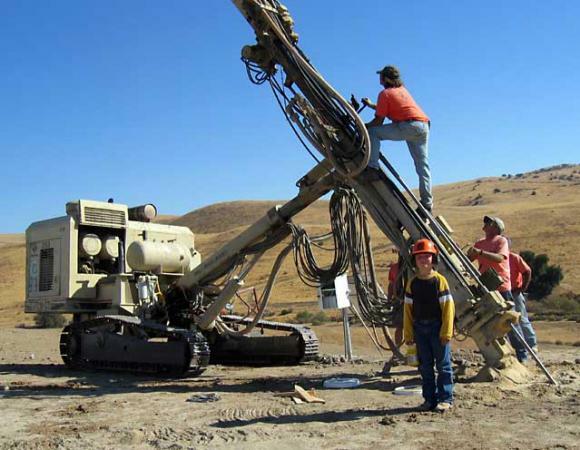 To their dismay, the drill rig blows the part of the hydraulic system which is used to move the rig and the arm that holds the drill bit. Unable to proceed, a new part is ordered to replace the broken piece and is and expected to arrive early Tuesday afternoon. Todd Williams and Andre Basset performed reconnaissance for site P530 and found a good site on privately owned land. Williams and Basset found the landowner agreeable when presenting the project; they were told that a family discussion had to take place before any decisions were made. With the drill rig now repaired, workers spent all of Wednesday drilling the five 35-foot holes for the support legs of emergency response station P532. At the same time, Ed Arnitz kept himself busy by putting up the galvanized steel post and mounting the solar panels and equipment enclosure. Concurrently, Todd Williams and Andre Basset returned to permanent station P539 (installed the previous week) to build a fence. 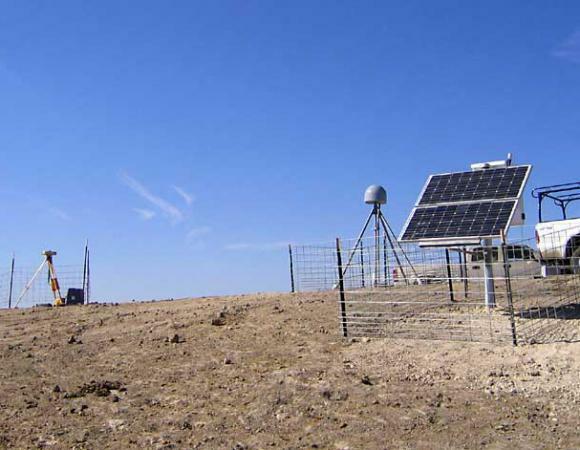 Because this site is in the middle of a cow pasture, fencing is needed to keep curious bovine away from the station and especially to keep them from scratching their heads on the solar panels. There’s a rumor out there that these big beefy animals enjoy looking at their reflection in the solar panel on sunny days (in addition to the PBO engineers, the cows probably do it too’). 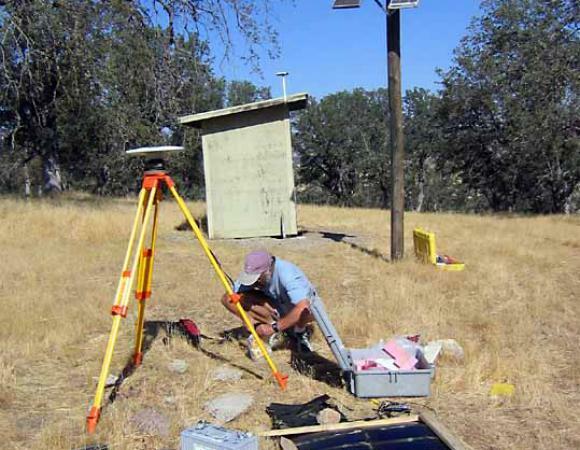 Working as a USGS volunteer, accompanied by Gary Hamilton (US Geological Survey), Brian Coyle helped to set up a campaign GPS equipment at the benchmark MOOSEHEAD (a steel pin inserted into the ground to act as stable monument), near to the proposed site of emergency response station P283. This temporary station will gather data that can later be tied into the data set of P283 after it is installed. Next, Hamilton and Coyle visited a USGS campaign GPS station at the benchmark GO42. This campaign station is near to the proposed site of emergency response station P282, and data from GO42 will be tied into the data set of P282 after it is installed. Off in another direction, Chris Walls and Jim Sutton (US Geological Survey) visited USGS campaign site SH2S. While Sutton checked the station, Walls performed reconnaissance for another permanent station, P287. 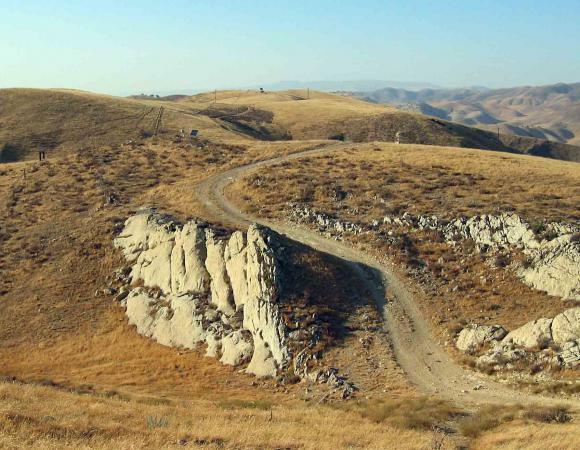 After finding a good location north of the Parkfield area and on the east side of the San Andreas Fault, Walls met with the landowner and obtained a permit. Ed Arnitz and Andre Basset started grouting the legs of P532 first thing in the morning. 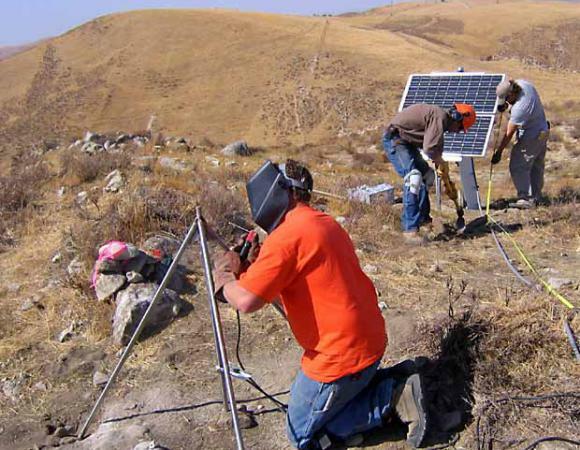 As the day went on and the temperature began to rise, the crew moved quickly, welding the legs together, installing the antenna, setting up the receiver and CDMA modem, and finishing the DDBM installation by the end of the day. Data from the first week was downloaded from the campaign (temporary) GPS station and sent back to Boulder. To acquire overlapping data, this campaign GPS station will be left running next to the permanent station, collecting data for a while longer. 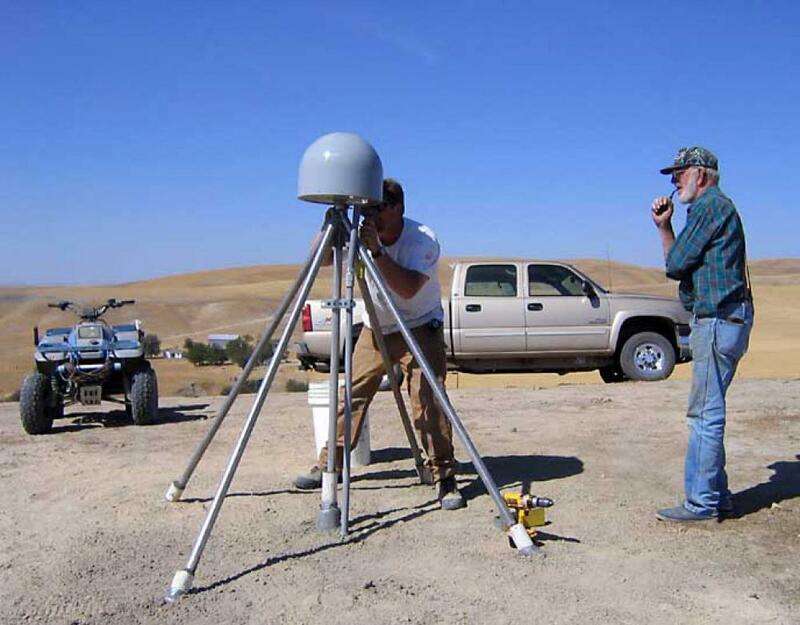 Accompanied by US Geological Survey’s John Langbein, Brian Coyle helped to set up campaign GPS equipment at the benchmark CREEK, near to the proposed site of emergency response station P281. 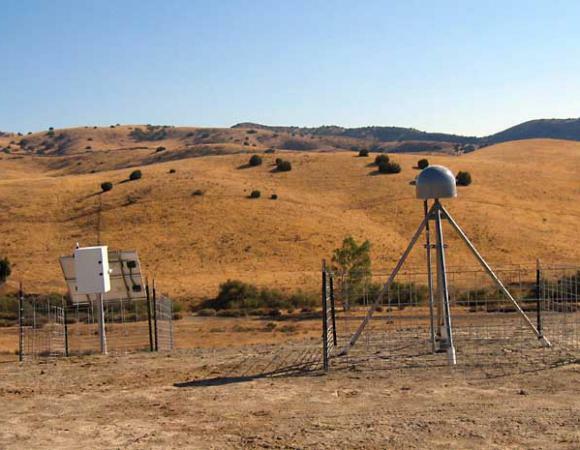 This temporary station will gather data that can be later tied into the data set of the permanent station. After touching base with additional landowners and following up with last minute details, the exhausted crews pack up their equipment and make the drive back to the northern and southern PBO offices, ready for a short break from the field.